How Much Do Triple Pane Windows Cost? What Are Triple Pane Windows? The average cost for a replacement triple pane window installation is $550 to $850 per triple paned window + labor costs which can average around $38 per hour depending on your local window installers average price. Because of the additional pane of glass and more complex construction and installation, you can expect to pay at least 10 to 15% more for triple pane vs double pane windows. It is estimated it can take a homeowner up to 30 years or more to fully recoup this amount through energy savings and payments. 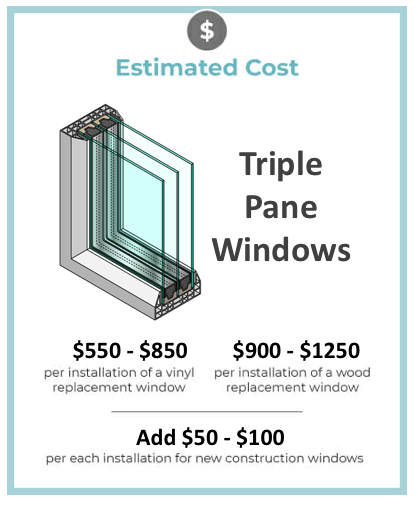 The costs of triple pane window replacement will always vary depending on your local window price & service cost range. Here are a few things that you will need to consider in order to get an accurate average of window costs. Number of replacement windows needed. Labor costs – these can vary depending on local rates, season, and the work load for your specific project. * For a more accurate total price estimate in your area use our triple pane window replacement cost calculator to search by zip code and more. Triple pane windows — the most advanced windows on the market today—are made with three panes of glass. As with double paned windows, each of the 3 panes has a spacer around the edges to give them a uniform space between layers. A seal between each pane makes the windows airtight and allows for pockets of gas to fill the space for improved insulation. If you’re having trouble deciding between replacement double pane or triple pane windows, you’ll need to consider the potential insulation improvements. Just take a look at double and triple pane windows and you’ll see that the U-factor (rate of heat loss) is better in the triple pane glass option, making them the better insulator. The most obvious benefit of triple pane windows is an increase in energy efficiency—they offer an improvement of up to 20-30% on energy efficiency if you consider Solar Heat Gain Coefficients (SHGC) and U-factors. While these statistics will vary according to where you live and the exact windows your home has, you can find out more about your windows’ energy efficient performance by checking out their Energy Star rating. Triple pane windows are more effective at keeping out sound than single or double pane windows. This particularly beneficial if you live in a city or some other noisy environment. For some, this advantage can be worth the extra cost of the windows on its own. 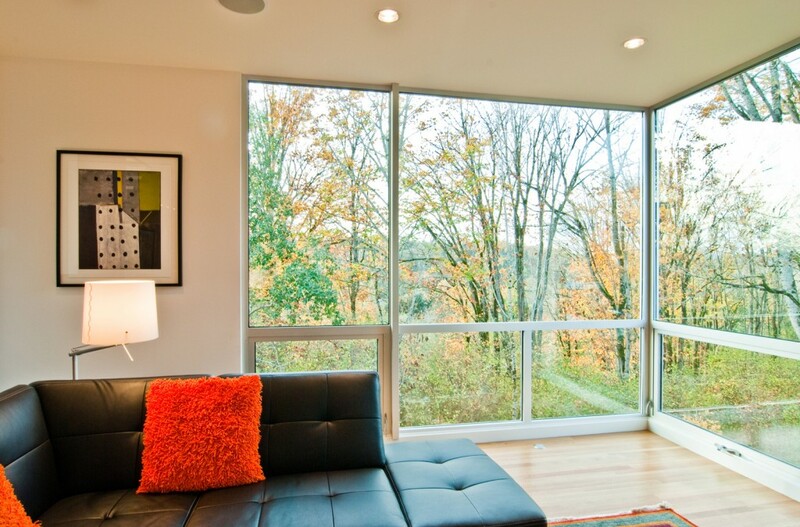 Check out some of the best soundproof windows. Because of their advanced insulating properties, triple pane windows are better at regulating your home’s temperature at a comfortable level. This affects your expended energy and monthly energy bills, but also your relationship to your home. For example, if you have a favorite spot next to the window in your favorite chair, single pane windows can limit your time here, but triple pane windows will allow you to stay comfortable and warm in your spot until you’re ready to leave. As discussed earlier the main issue with triple paned windows is the cost. If you need an accurate measurement of the cost of replacement triple pane glass windows use our windows cost calculator here.